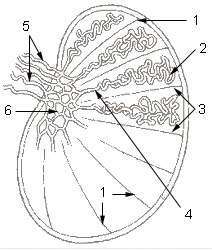 The rete testis (/ˈriti ˈtɛstɪs/) is an anastomosing network of delicate tubules located in the hilum of the testicle (mediastinum testis) that carries sperm from the seminiferous tubules to the efferent ducts. It is the counterpart of the rete ovarii in females. Its function is to provide a site for fluid reabsorption. Micrograph of the rete testis. H&E stain. 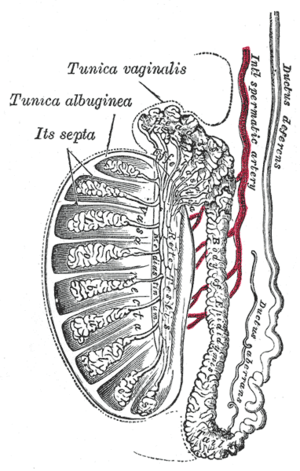 The rete testis is the network of interconnecting tubules where the straight seminiferous tubules (the terminal part of the seminiferous tubules) empty. It is located within a highly vascular connective tissue in the mediastinum testis. The epithelial cells form a single layer that lines the inner surface of the tubules. These cells are cuboidal, with microvilli and a single cilium on their surface. 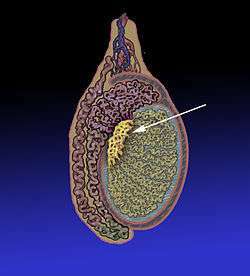 In the development of the urinary and reproductive organs, the testis is developed in much the same way as the ovary, originating from mesothelium as well as mesonephros. Like the ovary, in its earliest stages it consists of a central mass covered by a surface epithelium. In the central mass, a series of cords appear. These cords run together toward the future hilum and form a network that ultimately becomes the rete testis. It is in the rete testis that the sperm become concentrated and other fluids are reabsorbed. If this does not occur, the sperm that enter the epididymis will not be concentrated, resulting in possible infertility. Rete tubular ectasia is a disorder of the rete testis characterized by multiple benign cysts. Micrograph of the rete testis involved by seminoma. H&E stain. ↑ Ross, M.; Pawlina, W. (2011). Histology: A Text and Atlas (6th ed.). Lippincott Williams & Wilkins. p. 802. ISBN 978-0-7817-7200-6. ↑ Young, B.; Woodford, P.; O'Dowd, G. (2013). Wheater's Functional Histology: A Text and Colour Atlas (6th ed.). Elsevier. p. 344. ISBN 978-0702047473.